100% Candice: Are you on Google+? If you are reading this on or near December 8th, chances are pretty good that you are a Google+ user since Blogger shares automatically to my G+ page. But if it's at least 24 hours past that, you probably stumbled across this post via some other social share, or by searching for info about Google+. For the second group, this post is for you. So, are you on Google+? Technically speaking, you probably are. But I suspect you are not using it yet. There's a lot of confusion around G+. People aren't quite sure why they need another social network. People think it's a graveyard, there's no one there. Me, I kind of love Google+. I've been pretty active on their since one month after it launched. Because I've been a pretty active user, I have almost 800 followers and the content I've shared there has been viewed almost 2 million times. I shared these numbers with my boyfriend Nick and he almost jumped out of his seat. To him those numbers seem unfathomable. He's a user of G+, but probably not as active as I am. He is somewhere between you and I, not a big fan, but at least tries to post on there. Most people consider G+ to be a graveyard. Nobody is there. But that is absolutely not true. What is more likely is that nobody you know is there. Here in Guelph I have a circle of local people which has 200 people in it. Maybe 5% of those people post at all, and about 1-2% of them actually use the platform. I say that posting and using G+ are different things because Google has integrated G+ into many of their other services so when you use those, they post that activity to your profile. Like when you comment on a YouTube video, or when you post an blog using Blogger, or when you leave a review on a local business. I shouldn't have to say it, but people need to re-learn each time. Social networking is about networking. As in talking with other people. Most of the time if someone decides to start using G+ they start posting statuses, articles, photos etc and then nobody responds and they give up. The key to making relationships online is responding to other people. You would have a much better experience on G+ if you commented on someone else's post. 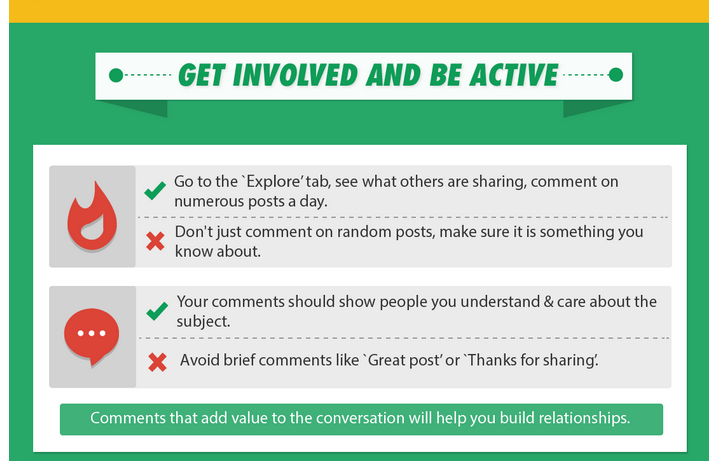 This infographic has some really great tips on how to get better engagement from G+. Beyond the usual tips to make your profile look good and interesting to encourage followers, the first and second tips are about talking with other people, by commenting on their posts, and by joining communities and answering others questions. I urge you to jump into G+ and start meeting people. You might not meet any locals, but you can meet some interesting people you may learn from. I need only a paragraph to answer the first question, why do we need another social network. Google is the biggest search network in the world. Posts on Google+ which match your search terms will show up. Especially if they are posted from people you are connected to somehow. The same is also true for your clients. If you want to be found online, you want to play in Google's sandbox.